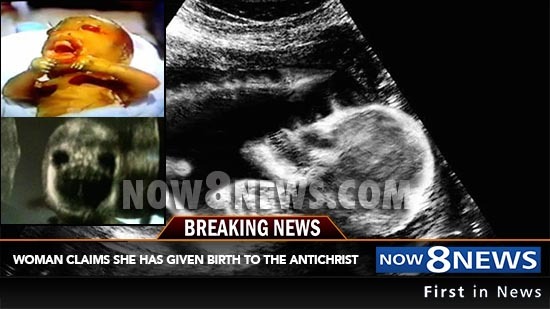 NEWS 8 – A 28-year-old Utah woman gave birth to a full term baby boy on Friday, but the images of the infant during pregnancy ultrasounds, and the strange incidents that happened during the birth has hospital staff in shock. Suzanne Connors, the now single mother of one, said her pregnancy was anything but normal. According to hospital staff, during the 31 hours of labor, Connors was screaming in excruciating pain. Even through the epidural, she claimed she felt like she was being sliced apart on the inside. That’s when doctors opted for a cesarean section. During the emergency C-section, doctors found that Connors uterus and amniotic sac were completely ripped to shreds. Doctors cannot explain how the baby survived without amniotic fluid for so long. Connors says she is giving her son up for adoption because she will “have no part in raising the antichrist.” Currently, the infant is under examination by scientists at a nearby pediatric hospital. The future of the young boy is still unknown. A social services representative said there is no way they can place the child in a foster home with his aggressive behavior. According to hospital staff the baby sliced the arm of the delivery nurse when it was handed off to her. Connor says the father cannot be contacted do to the fact he was a “one night stand” and she only knew his first name. The young mother says she is excited to go on with her life and put this horrifying incident behind her.